This list of tallest buildings in New Jersey ranks skyscrapers and high-rises in the U.S. state of New Jersey by height. The tallest building in New Jersey is the residential 99 Hudson Street in Jersey City, which topped out at 889 feet (271 m) in September 2018. The 42-story 30 Hudson Street, known widely as the Goldman Sachs Tower, which rises 781 feet (238 m) at Exchange Place in Jersey City is the state's tallest commercial building. It is also the 69th-tallest building in the United States. The tallest building in New Jersey outside Jersey City is the 57-story Ocean Resort Casino, which rises 709 ft (216 m) in Atlantic City and ranks as the second-tallest casino tower in the United States. 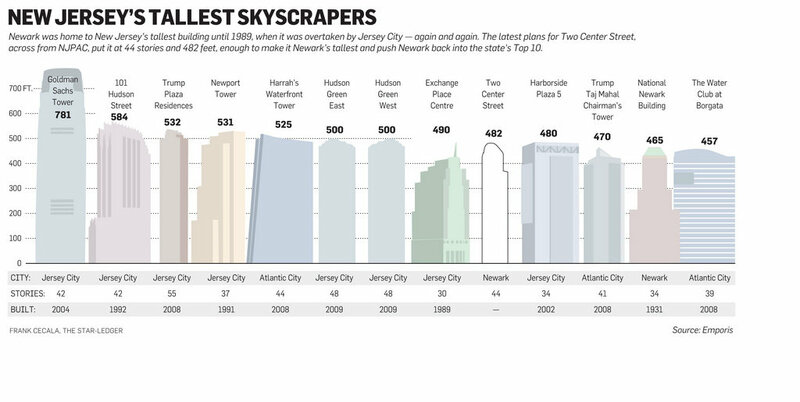 This list ranks New Jersey skyscrapers that stand at least 100 meters (330 ft) tall, based on standard height measurement. This includes spires and architectural details but does not include antenna masts. An equal sign (=) following a rank indicates the same height between two or more buildings. The "Year" column indicates the year in which a building was completed. 3 URBY Harborside Tower I 713 ft (217 m) 69 2017 Jersey City Second-tallest building in Jersey City. Topped out in September 2015. 4 Ocean Resort Casino 709 ft (216 m) 57 2012 Atlantic City Tallest building in Atlantic City since 2012 and the second-tallest casino tower in the United States. Formerly known as Revel. 5 Journal Squared Tower I 574 ft (175 m) 54 2017 Jersey City Completed in 2017, and part of a three tower complex. 6 101 Hudson Street 548 ft (167 m) 42 1992 Jersey City Tallest building constructed in New Jersey in the 1990s. 16 Exchange Place Center 490 / 149 30 1989 Jersey City Tallest building constructed in New Jersey in the 1980s. 20 National Newark Building 465 / 142 34 1931 Newark Tallest building constructed in New Jersey in the 1930s and tallest building in Newark since 1931. Prudential Plaza Building 374 / 114 24 1960 Newark Tallest building constructed in New Jersey in the 1960s. Camden City Hall 371 / 113 18 1931 Camden Tallest building in Camden since 1931. Tallest building in the Philadelphia metropolitan area that is located outside of Philadelphia. One Gateway Center 359 / 109 30 1971 Newark Tallest building constructed in New Jersey in the 1970s. 2004–2018 30 Hudson Street 781 / 238 42 2004 Jersey City Tallest non-residential building in New Jersey. 2018- Present 99 Hudson Street 900 ft (270 m) 79 2018 Jersey City Topped out in September 2018. Due to open in 2019. ^ "30 Hudson Street". Emporis.com. Retrieved 2007-11-19. ^ "30 Hudson Street". Skyscraperpage.com. Retrieved 2007-11-19. ^ "URL Harborside Tower I". Emporis.com. Retrieved 2015-11-19. ^ "Views Revealed From Top Of 69-Story Urban Ready Living Harborside Tower, Jersey City". New York YIMBY. Retrieved 2015-11-19. ^ "Revel South Tower". Skyscraperpage.com. Retrieved 2011-05-05. ^ "Revel South Tower". Emporis. Retrieved 2011-05-05. ^ "Journal Squared's first Jersey City tower will rent from S1,800". NY.Curbed.com. Retrieved 2017-01-30. ^ "First Journal Squared tower should be finished by end of 2016". NJBiz.com. Retrieved 2017-01-30. ^ "101 Hudson Street". Emporis.com. Retrieved 2007-11-19. ^ "101 Hudson Street". Skyscraperpage.com. Retrieved 2007-11-19. ^ "Trump Plaza I". Emporis.com. Retrieved 2007-11-24. ^ "Trump Plaza I". SkyscraperPage.com. Retrieved 2007-11-25. ^ "Newport Tower". Emporis.com. Retrieved 2007-11-19. ^ "Newport Tower". Skyscraperpage.com. Retrieved 2007-11-19. ^ "Newport Tower". Emporis.com. Retrieved 2018-10-17. ^ "Harrahs Waterfront Tower". Emporis. Retrieved 2011-05-05. ^ "Harrahs Waterfront Tower". Sktscraperpage.com. Retrieved 2011-05-05. ^ "The Center 1". Skysvraperpage. Retrieved 2012-10-10. ^ Steinberg, Russel (June 1, 2012). "Fort redevelopment plan unveiled". The Real Deal. Retrieved 2012-10-10. ^ "The Modern". SJP Residential. Retrieved 2012-11-01. ^ "Exchange Place Center". Emporis.com. Retrieved 2007-11-19. ^ "Exchange Place Center". Skyscraperpage.com. Retrieved 2007-11-19. ^ "Trump Plaza I". Emporis.com. Retrieved 2018-10-27. ^ "Harborside Plaza 5". Emporis.com. Retrieved 2007-11-19. ^ "Harborside Plaza 5". Skyscraperpage.com. Retrieved 2007-11-19. ^ "Trump Taj Mahal Chairman Tower". Emporis. Retrieved 2011-05-05. ^ a b "Graph of New Jersey's twelve tallest buildings (2010)". Star Ledger. 2010. Archived from the original on 2011-07-16. Retrieved 2011-05-05. ^ "Trump Taj Mahal Chairman Tower". Skyscraperpage.com. Retrieved 2011-05-05. ^ "National Newark Building". Emporis.com. Retrieved 2009-07-05. ^ "National Newark Building". SkyscraperPage.com. Retrieved 2009-07-05. ^ "The Water Club at Borgata". Emporis. Retrieved 2011-05-05. ^ "The Water Club at Borgata". Skyscraperpage.com. Retrieved 2011-05-05. ^ "M2 @ Marbella". Emporis.com. Retrieved 2018-10-27. ^ "Southampton Apartments". Emporis.com. Retrieved 2007-11-19. ^ "Southampton Apartments". Skyscraperpage.com. Retrieved 2007-11-19. ^ "Atlantic Apartments". Emporis.com. Retrieved 2007-11-19. ^ "Atlantic Apartments". Skyscraperpage.com. Retrieved 2007-11-19. ^ "Riverside Apartments". Emporis.com. Retrieved 2007-11-19. ^ "Riverside Apartments". Skyscraperpage.com. Retrieved 2007-11-19. ^ "East Hampton Apartments". Emporis.com. Retrieved 2007-11-19. ^ "East Hampton Apartments". Skyscraperpage.com. Retrieved 2007-11-19. ^ "Eleven 80". Emporis.com. Retrieved 2009-07-05. ^ "Eleven 80". SkyscraperPage.com. Retrieved 2009-07-05. ^ "The Palisades". Emporis. Retrieved 2012-10-09. ^ "The Ellipse". Emporis.com. Retrieved 2018-10-27. ^ "Borgata Hotel and Casino". Emporis. Retrieved 2011-05-05. ^ "Borgata Hotel and Casino". Skyscraperpage.com. Retrieved 2011-05-05. ^ "Trump Taj Mahal Casino Hotel". Emporis. Retrieved 2011-05-05. ^ "Trump Taj Mahal Casino Hotel". Skyscraperpage.com. Retrieved 2011-05-05. ^ "Marbella Apartments". Emporis.com. Retrieved 2007-11-24. ^ "Marbella Apartments". Skyscraperpage.com. Retrieved 2007-11-24. ^ "Galaxy Towers". Emporis. Retrieved 2012-10-08. ^ "Liberty View Towers - East Building". Emporis.com. Retrieved 2007-11-19. ^ "Liberty View Towers East". Skyscraperpage.com. Retrieved 2007-11-19. ^ "Liberty View Towers - West Building". Emporis.com. Retrieved 2007-11-19. ^ "Liberty View Towers West". Skyscraperpage.com. Retrieved 2007-11-19. ^ "Bally's Atlantic City". Emporis. Retrieved 2011-05-05. ^ "Bally's Atlantic City". Skyscraperpage.com. Retrieved 2011-05-05. ^ "Prudential Plaza Building". Emporis.com. Retrieved 2009-07-05. ^ "Prudential Plaza Building". SkyscraperPage.com. Retrieved 2009-07-05. ^ "Camden City Hall". Emporis. Retrieved 28 May 2012. ^ "Camden City Hall, Camden". SkyscraperPage.com. Retrieved 28 May 2012. ^ "Camden City Hall, Camden". Emporis. 2012. Retrieved 25 June 2012. ^ "Claridge Atlantic City". Emporis. Retrieved 2011-05-05. ^ "Claridge Hotel". Skyscraperpage.com. Retrieved 2011-05-05. ^ "The Palisades". Emporis. Archived from the original on 2013-04-09. Retrieved 2012-10-10. ^ "Parker Imperial". Emporis. Retrieved 2011-06-06. ^ "80 Park Plaza". Emporis.com. Retrieved 2009-07-05. ^ "80 Park Plaza". SkyscraperPage.com. Retrieved 2009-07-05. ^ "Ocean Club East Tower". Emporis. Retrieved 2011-05-05. ^ "Ocean Club West Tower". Emporis. Retrieved 2011-05-05. ^ "One Gateway Center". Emporis.com. Retrieved 2009-07-05. ^ "One Gateway Center". SkyscraperPage.com. Retrieved 2009-07-05. ^ "Riviera Tower". Emporis. Retrieved 2011-05-05. ^ "Resorts Atlantic City Renedezvous Tower". Skyscraperpage.com. Retrieved 2011-05-05. ^ "The Flagship Resort". Emporis. Retrieved 2012-10-09. ^ "IN NEWARK, A CONDOMINIUM FOR LAW FIRMS". New York Times. June 17, 1984. Retrieved 2010-08-31. ^ "TALLEST BUILDING IN NEW JERSEY; Firemen's Insurance Co.'s New Home in Newark Will Be 205 Feet High" (PDF). The New York Times. February 6, 1910. Retrieved 2012-10-09. ^ "Firemen's Insurance Building". Emporis. Retrieved 2012-10-09. ^ "Macys Department Store". Emporis. Retrieved 2012-10-09. ^ "Image of Military Park Building". Emporis.com. Retrieved 2009-07-05. This page was last edited on 23 March 2019, at 16:07 (UTC).